Ayatollah Ul Uzma Syed Dildar Ali (EHD’F’ 3J/ /D/’1 9DI) - also known as Ghufran Ma’ab (:A1’F E’() was scholar Shia scholar of India who originated from a family of scholars from the village of Nasirabad, 3km from their native village of Jais, in Uttar Pradesh, India. The title "Ghufran Ma’ab" was giving to him by scholars in Najaf, Iraq and means "the one who lives in heaven" due to his scholarly attributes. The opportunities for education and patronage available to Shi‘i ulama from 1766 are demonstrated by the career of Sayyid Dildar ‘Ali Nasirabadi (1753-1820). Born and raised in the large, Sayyid-dominated village of Nasirabad in Rai Bareli not far from Lucknow, as a youth Sayyid Dildar ‘Ali learned Arabic and studied some basic texts in Nasirabad itself. He set out for other towns in order to pursue the rational sciences with individual scholars in the Muslim small towns. Nasirabadi’s search for knowledge took him to the provincial capital of Allahabad, which had a relatively large Shi‘i population. He joined the classes of the Imami philosopher Ghulam Husayn Dakani Ilahabadi, with whom he studied most of the basic textbooks for the rational sciences. As was noted above, in 1769-72 Nasirabadi explored cosmography (hay’at ) with Tafazzul Husayn Khan, conveying questions and answers on the abstrusities of logic between his two mentors. Sayyid Dildar ‘Ali’s student days were hard ones before he found a patron, and at one point he reportedly made a deal with a Hindu shopkeeper to serve as a night watchman for his shop if he could sleep on its doorstep. Young Nasirabadi’s peregrinations also took him north to Shahjahanpur, which served until 1774 as the capital of Hafiz Rahmat Khan’s Ruhilah domain. Until that date Shahjahanpur was an important, if small, intellectual center with the Farangi Mahall tradition strongly represented by two former heads of that institution, Mulla ‘Abdu’l-‘Ali and Mulla Hasan. Sayyid Dildar ‘Ali furthered his exploration of the rational sciences at the hands of Mulla ‘Abdu’l-‘Ali, one of the foremost contemporary minds in this field. The Shi‘i student at one point engaged in a heated debate with his distinguished tutor. Mulla Hasan Farangi-Mahalli, who had once angrily ejected Tafazzul Husayn Khan from his class, also debated Sayyid Dildar ‘Ali on matters of metaphysics. The encounter of Sayyid Dildar ‘Ali with these former heads of Farangi Mahall in Shahjahanpur is rich in irony. Both were forced to leave Lucknow by Shi‘i communalists who enjoyed the backing of the nawab. Yet in their exile they taught and engaged in discussions with the future leader of Awadh’s Shi‘is. Admittedly, they may not hate known he was a Shi‘i. But even in the face of the most powerful Forces for communal strife and separation, education in Awadh remained strangely ecumenical. Sayyid Dildar ‘Ali left Shahjahanpur for Nasirabad, then journeyed to nearby Faizabad, where a number of Shi‘i ulama were gathering under the patronage of Shujau’d-Dawlah and his notables. |He fell ill,| and was chided by the old nawab for studying too hard. 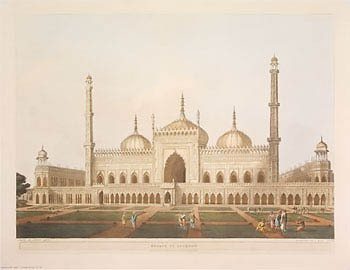 When he recovered he followed the new court of Asafu’d-Dawlah to Lucknow, where he taught and also completed his studies. The difficulties facing a student without a wealthy patron are illustrated by an incident from Nasirabadi’s youth. Unable to afford a servant to bring food from the city market, considered an unclean place where no gentleman would be seen, students had to do their own shopping. One of Nasirabadi’s colleagues, Sayyid ‘Abdu’l-‘Ali Deoghatavi, volunteered to go to the bazaar, and was returning when he saw someone he knew coming down the road. He quickly hid himself. Then he considered that to hide a fault indicates a prideful desire to be honored by others. He caught up with his acquaintance, going out of his way to show himself and his bazaar-derived provisions. Finally, Nasirabadi’s diligence was rewarded. 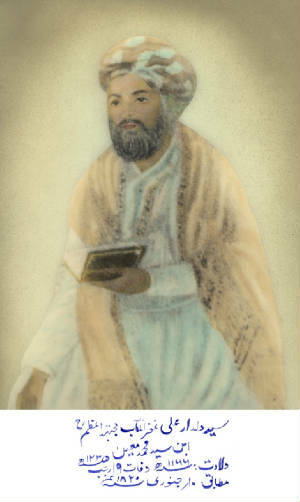 His reputation for piety and ability, as well as some of his early compositions, reached the notice of Awadh’s chief minister from 1777, Hasan Riza Khan. The illiterate official, having these works read to him, was favorably impressed and began financially supporting Sayyid Dildar ‘Ali, giving him a stipend of Rs. 30 per month and including him among his companions. Still, the young scholar was overshadowed by other, more important recipients of the chief minister’s patronage, such as Sufi leaders. The Shi‘i notables in India did not at this point hold the ulama in such high esteem, preferring unlettered mystics to learned scholars. As the Shi‘i-ruled state of Awadh began developing a more extensive local bureaucracy, and as its notables increasingly felt a need to promote their branch of Islam, the ulama became more important. The patron-client relationship expanded and changed in character. Younger scholars, such as Sayyid Dildar ‘Ali, pioneered a new phase in ulama-state relations in the last quarter of the eighteenth century. Yet the need felt by the notables for a Shi‘i clerical class was frustrated by the lack of local scholars trained in specifically Shi‘i sciences. In the absence of a Shi‘i seminary in North India, one solution was to have some teachers trained in the Shi‘i intellectual centers of Iran and Iraq. Sayyid Dildar ‘Ali took his place among an increasing flow of Awadh Shi‘i scholars to the Shi‘i shrine cities of Mamluk Iraq, who went to study Shi‘i law and help spread the religion in India upon their return. An important predecessor, Mirza Khalil, went from Lucknow to Iraq, where he studied with the young Sayyid ‘Ali Tabataba’i, the nephew and son-in-law of Usuli leader Aqa Muhammad Baqir Bihbahani. Mirza Khalil, impressed with his teacher, endeavored to convince him to journey with him to India "in order to eradicate unbelief and ignorance." Sayyid ‘Ali, taken aback, fervently expressed his desire that God would never show him India or part him from the shrine cities. He reacted to the pious entreaty as if someone had prayed that evil might befall him. Most high ulama in Iran and Iraq showed reluctance to give up all the benefits they derived from living at the Shi‘i center in order to undertake a missionary career in an alien environment like North India. Mirza Khalil on his return had his patron, Almas ‘Ali Khan, offer another scholarship of Rs. 2,000 for study in Iraq, to Akhbari notable scholars, but they refused it as too small. Finally Mirza Khalil went to another Akhbari, Sayyid Dildar ‘Ali Nasirabadi, who at first begged off on the grounds that he had just married and lacked means to support his wife while traveling. The moral imperative of such a journey, however, outweighed these considerations, and he set out in 1779 with one young companion, Sayyid Panah ‘Ali. They proceeded arduously overland through Rajasthan to Hyderabad in Sindh, and thence to the coast, where they boarded a ship for the sea journey to Basra. Sayyid Dildar ‘Ali Nasirabadi’s Journey to the Shrine Cities in 1779-81 encountered the now largely Usuli atmosphere of the shrine cities and found it disturbing. After performing visitation to the shrine of Imam ‘Ali, Sayyid Dildar ‘Ali met with prominent Shi‘i scholars in Najaf, committed Usulis. After several debates with them, Nasirabadi decided that if he insisted on arguing with his teachers, he would learn nothing. He then shifted north to Karbala, studying the oral reports from the Imams with Aqa Muhammad Baqir Bihbahani then seventy-five, and law with Bihbahani’s younger disciples. Sayyid Dildar ‘Ali determined to throw himself into a study of Usuli works, given their rarity in India. He read widely on the issue of the validity of those oral reports that were related by only a single transmitter in each early generation (khabar al-ahad ). After study of the classical writers, Sayyid Dildar ‘Ali began to doubt the validity of Astarabadi’s position. In the space of a few months from his arrival in Iraq he adopted the Usuli school, one reason surely being the predominance of this ideology at the centers of Shi‘i scholarship. He later perceived this change of views to be one of the graces he received by virtue of his proximity to the holy tombs of the Imams. Nasirabadi then sought out another of Bihbahani’s students, Sayyid Muhammad Mihdi Tabataba’i, and studied with him briefly. He pointed out to his teacher that in the Usuli system either a believer must be himself a mujtahid, or he must emulate a living mujtahid. But, he continued, the Shi‘is of India were deprived of any opportunity for either, so that they might land in perdition. Tabataba’i replied that Indian Shi‘is must practice caution (ihtiyat ), following the most strict of the major positions on any matter of law. Nasirabadi riposted that Majlisi I once said that the most cautious position was not always the correct one. Sayyid Muhammad Mihdi answered that such instances were rare. Sayyid Dildar ‘Ali’s dissatisfaction with the practice of caution as a solution to the dilemma of Indian Usulis suggests that even then he saw the need for religious leadership which the spread of Usulism in Awadh would create. Because of his Indian background Nasirabadi had great difficulty in being taken seriously as a scholar, some Iranian students insisting that there simply were no ulama in India. They found the very thought of an Indian mujtahid absurd, given that only three scholars at the shrine cities were recognized exemplars. After about a year and a half, Sayyid Dildar ‘Ali returned to India overland via Kazimayn, Tehran, and Mashhad, wintering in Khurasan and studying there briefly. On arriving in Lucknow he met with Hasan Riza Khan and had an interview with Nawab Asafu’d-Dawlah. In 1781 he began teaching and writing in Lucknow, producing a wide-ranging attack on Akhbari ideas and beginning the task of training a new generation of Shi‘i scholars in Usuli sciences.